WHO estimates that there were 600 000 new cases with resistance to rifampicin – the most effective first-line drug, of which 490 000 had MDR-TB. And tomorrow is World TB Day! Multidrug-resistant Tuberculosis (MDR-TB) remains a public health crisis and a health security threat. Anti-TB medicines have been used for decades and strains that are resistant to 1 or more of the medicines have been documented in every country surveyed. Drug resistance emerges when anti-TB medicines are used inappropriately, through incorrect prescription by health care providers, poor quality drugs, and patients stopping treatment prematurely. Learn more about tuberculosis (TB) in the lead-up to World TB Day this Saturday, 24 March. Tuberculosis (TB) is one of the top 10 causes of death worldwide. In 2016, 10.4 million people fell ill with TB, and 1.7 million died from the disease (including 0.4 million among people with HIV). Over 95% of TB deaths occur in low- and middle-income countries. About one-quarter of the world’s population has latent TB, which means people have been infected by TB bacteria but are not (yet) ill with the disease and cannot transmit the disease. Multidrug-resistant TB (MDR-TB) remains a public health crisis and a health security threat. WHO estimates that there were 600 000 new cases with resistance to rifampicin – the most effective first-line drug, of which 490 000 had MDR-TB. People infected with TB bacteria have a 5–15% lifetime risk of falling ill with TB and becoming infectious. However, persons with compromised immune systems, such as people living with HIV, malnutrition or diabetes, or people who use tobacco, have a much higher risk of falling ill. When a person develops active TB disease, the symptoms (such as cough, fever, night sweats, or weight loss) may be mild for many months. This can lead to delays in seeking care, and results in transmission of the bacteria to others. People with active TB can infect 10–15 other people through close contact over the course of a year. 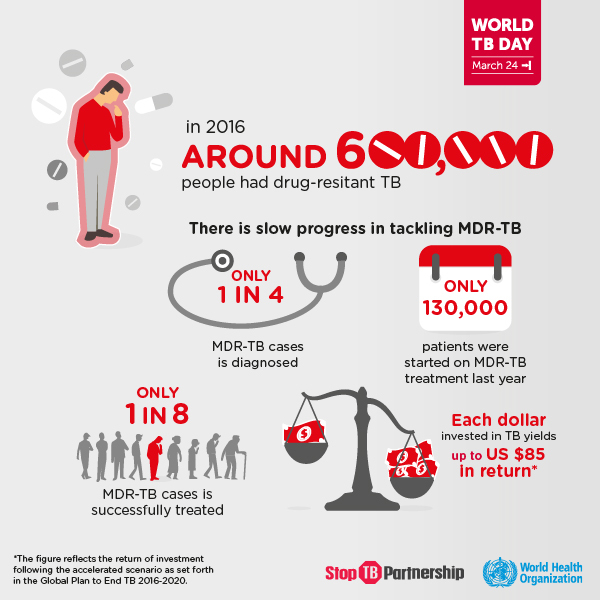 World Tuberculosis Day 2018 – 24 March: Tests for TB? “How do I know if I have been infected with TB germs”? Read about the tests you can take if you have been exposed. I’m running this article as part of promoting public awareness and health education about tuberculosis, in the lead-up to World TB Day this Saturday (24 March). “TB is still very real in our world today,” observes Dr Siaw Tung Yeng, Founder & CEO, Mobile Health which built the MaNaDr Healthcare Ecosystem. There are two tests that can be used to help detect TB infection: a TB skin test or TB blood test. The skin test is used most often. A small needle is used to put some testing material, called tuberculin, under the skin. In 2-3 days, you return to the health care worker who will check to see if there is a reaction to the test. In some cases, a TB blood test is used to test for TB infection. This blood test measures how a person’s immune system reacts to the germs that cause TB. World Tuberculosis Day 2018 – 24 March: What is TB? This year’s World TB Day is on this Saturday – it falls on 24 March every year. As part of public awareness and education about tuberculosis, we take a look at what is TB. This logo is the symbol for the goal ending TB. Every 18 seconds someone dies of TB. End TB by ensuring that everyone affected by TB gets the right diagnosis, treatment, and care. “TB” is short for a disease called tuberculosis. TB germs are passed through the air when someone who is sick with TB disease of the lungs or throat coughs, speaks, laughs, sings, or sneezes. Anyone near the sick person with TB disease can breathe TB germs into their lungs. TB germs can live in your body without making you sick. This is called latent TB infection. This means you have only inactive (sleeping) TB germs in your body. The inactive germs cannot be passed on to anyone else. However, if these germs wake up or become active in your body and multiply, you will get sick with TB disease. When TB germs are active (multiplying in your body), this is called TB disease. These germs usually attack the lungs. They can also attack other parts of the body, such as, the kidneys, brain, or spine. 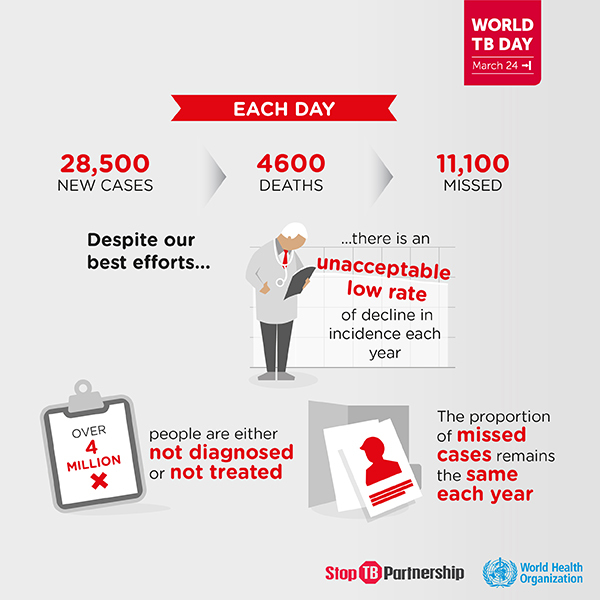 World TB Day falls on 24 March every year – the purpose is to raise public awareness about the devastating health, social and economic impact of tuberculosis (TB) and urge acceleration of efforts to end the global TB epidemic. 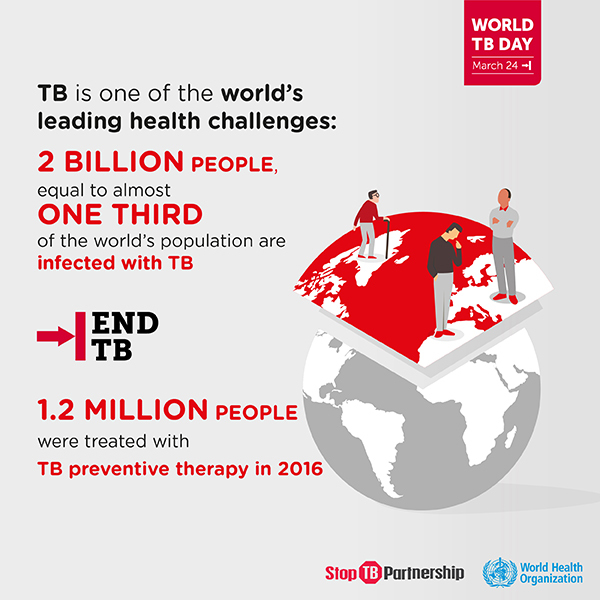 This year’s World TB Day is on this Saturday – 24 March, 2018. This year, we commemorate the 136th anniversary of Dr. Robert Koch’s announcement in 1882 of his discovery of the TB bacillus, the cause of TB.